A RECENT POLL has shown that only 25% of people have confidence in Simon Harris as health minister. The Claire Byrne Live/Amarach poll found that 45% of people said they did not have confidence, while 30% didn’t know. The health ministry has long been the poisoned chalice in the politics game. Not many who have held the portfolio have emerged unscathed. Like a merry-go-round, politicians from all parties get on the health service rollercoaster, only to jump off again, with an ailing health service left behind, and another once shiny new plan for reforms left in a corner to gather dust. However, with the government committing to rolling out Sláintecare – a ten-year plan for the health service, perhaps this will change. Who would ever think of taking on the job? There have been quite a few in recent years, from Fine Gael’s James Reilly, the Taoiseach Leo Varadkar, as well as politicians from other parties such as Fianna Fáil’s Micheál Martin and Labour’s Brendan Howlin. “The health portfolio always has been, and is likely to always remain a hugely challenging role. But it can be an immensely rewarding one too – every improvement made to our health services has a profound impact on the health and lives of our people,” Howlin told TheJournal.ie. The Labour leader was health minister from 12 January 1993 – 17 November 1994 under Taoiseach Albert Reynolds. While Harris is dealing with bed shortages, recruitment difficulties and astronomical long waiting lists, the health portfolio has always thrown up problems. When asked what his biggest challenge was as health minister, Howlin said it was trying to boost the service post the 1980s recession. Trying to rebuild morale in the health sector after a decade of under- investment in the 1980s was the greatest single challenge. The emergence of the AIDS crisis in Ireland was another massive challenge when I entered the health department. Fianna Fáil leader Micheál Martin was the health minister under Taoiseach Bertie Ahern from 27 January 2000 – 29 September 2004. “There were many low points particularly when children or babies died – there were high profile cases during my time both in Monaghan and Crumlin,” he told TheJournal.ie. Two-year-old Limerick girl Róisín Ruddle died at her home hours after being sent home by Our Lady’s Hospital for Sick Children in Crumlin, after her heart surgery was postponed. A premature baby was born in an ambulance en route to Cavan General Hospital after her mother was told she could not deliver the baby in Monaghan Hospital, where maternity services had been suspended. Independent inquiries into the tragic incidents were launched by Martin in 2003. “There were also protests against creating centres of excellence for breast care in a limited number of hospitals but I persevered and this has improved outcomes and saved lives,” added Martin. Fourteen years later, Harris is dealing with similar issues with inquiries into a number of baby deaths at both Cavan and Portiuncula Hospital. But there can be successes in the brief too. Martin often heralds how he introduced the controversial smoking ban to Ireland, which has no doubt saved many lives over the years. “When I was Minister for Health there were significant capital investments to very worthwhile projects across the country,” he added. For Howlin, there were other achievements. “The publication and implementation of our first national health strategy – Shaping a Healthier Future – was my most significant achievement. That strategy secured the broad support of those working in the sector, and remained the framework for health policy in Ireland until 2001. The liberalisation of access to contraception, and the identification of HIV/AIDS prevention as a national priority were other achievements I remain proud of,” he said. Brendan Howlin, a few years after holding the office as health minister. Both former health ministers acknowledge that the job was hugely challenging, but said that it has its rewards, despite what some people might say. “While being Minister for Health is very challenging you do get to see the effort that the staff working in the health service make while working in very difficult circumstances. “They deal with life and death issues every night and day. This is not easy and is made worse now with the staff shortages,” said Martin. The health portfolio always has been, and is likely to always remain a hugely challenging role. But it can be an immensely rewarding one too – every improvement made to our health services has a profound impact on the health and lives of our people. Is Simon Harris bothered by such a staggering number not having confidence that he can do his job? It doesn’t appear so. If opinions polls were right then Hilary Clinton would have been president and Brexit wouldn’t have happened. I’m not in this to be popular, I’m in this to get the job done. If I was to read newspapers, if I was only to hear the bad news stories in health every day then I wouldn’t get out of bed in the morning. He told the Claire Byrne Live programme this week that the people working “extraordinarily hard” in the job and the people who write to him about their good experiences in the health service “are what keep me going”. While speculation was rife during the reshuffle that he might have wanted out of health (it wasn’t the first time rumours surfaced that ministers wanted to be moved out of it), Harris said he is “really delighted to be in the job”. For far too long there was “chopping and changing” of ministers – and with each new minister, came a new plan, said Harris. What the health service needs now is stability, he said, adding that he is not going to fix the health service overnight, but the new 10-year plan might be a good place to start. 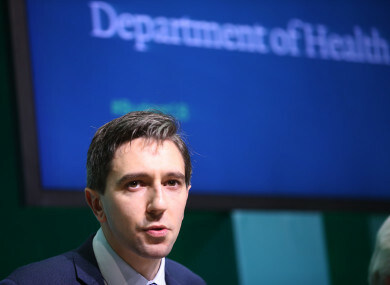 With the winter flu season upon us, and no doubt, the winter vomiting bug cases just around the corner, the strength of the health service will be put to the test in the weeks ahead, as will Simon Harris. Email “Harris says he's not in the job to be popular - but what did former health ministers make of it?”. Feedback on “Harris says he's not in the job to be popular - but what did former health ministers make of it?”.